Science Candy: How Hot is Your Tea? Researchers at the University of Tehran have found a link between drinking steaming hot tea and an increased risk of esophageal cancer, as published in the British Medical Journal. The study looked at people living in the Golestan province of Iran, an area where individuals drink over a liter of tea a day. Esophageal cancer has several contributing factors, including heavy alcohol consumption, tobacco use, chronic acid reflux, diet and obesity. Although alcohol and tobacco are the main contributors in the US and Europe, these activities are not common in Golestan, yet this province has one of the highest rates of esophageal cancer in the world. 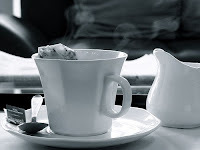 By studying the tea drinking habits of individuals with esophageal cancer compared with healthy participants in the region, it was determined that drinking tea at a temperature of 70C or higher increased the risk of esophageal cancer 8-fold compared to drinking tea at a temperature of 65C or less. So does this mean you should have a thermometer handy every time you want a soothing cup of tea? Not necessarily, but if anything, it is probably a good idea to avoid drinking scalding hot tea or liquids in general. Further investigations into how heat can lead to the development of cancer as well as the prevalence of medical conditions within the Golestan population that could lead to esophageal cancer susceptibility will continue to shed light on this interesting observation.